Assisted Living is a combination of housing and support services which provides help with many of the activities we do every day. At St. Andrew's Assisted Living of Bridgeton, support services include medication administration, the preparation and serving of three meals per day, and assistance with personal care. Assisted Living at St. Andrew's provides elders the benefits of a secure, comfortable lifestyle, complemented by independence and the opportunity to live life to its fullest. 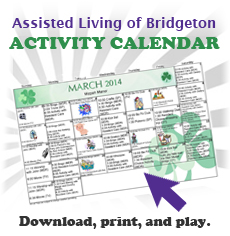 When is Assisted Living appropriate? Assisted Living is appropriate when an older adult is having difficulty preparing balanced meals, maintaining a household, or remembering to take medication. Seniors are able to preserve much of their independence if supportive services are provided in a comfortable, well designed, and properly staffed Assisted Living Community. What kinds of services are provided? We encourage independence. Our resident care staff is careful to ensure services meet individual resident's needs. We provide assistance with bathing and medication administration as well as weekly housekeeping and laundry services. All utilities, including basic cable TV, are included in the monthly fees. How are good eating habits and good nutrition encouraged? Three home-cooked, delicious meals are served daily in our pleasant dining room. Dining hours are flexible and convenient. Snacks are available as requested by residents. And our staff monitors our residents to be sure nutritional needs are being met. How is St. Andrew's staffed? St. Andrew's Assisted Living of Bridgeton is supervised by a Licensed Nursing Home Administrator and a Resident Care Director who is a nurse. Resident care staff is here 24 hours a day. Additional staff includes dining services, activity, and housekeeping personnel. Our residents live in private studio apartments with approximately 463 square feet of living space. Each apartment has a private bath and a kitchenette with a microwave oven and refrigerator. Wall-to-wall carpeting and window treatments are provided. Residents bring their own furnishings and are encouraged to decorate their apartments to suit their personal style and needs. Each apartment has two emergency call stations that are electronically connected to the residents' services office. Housekeeping and personal laundry services are provided on a weekly basis. What do St. Andrew's residents do during the day? You are encouraged to maintain the routines and activities you like. 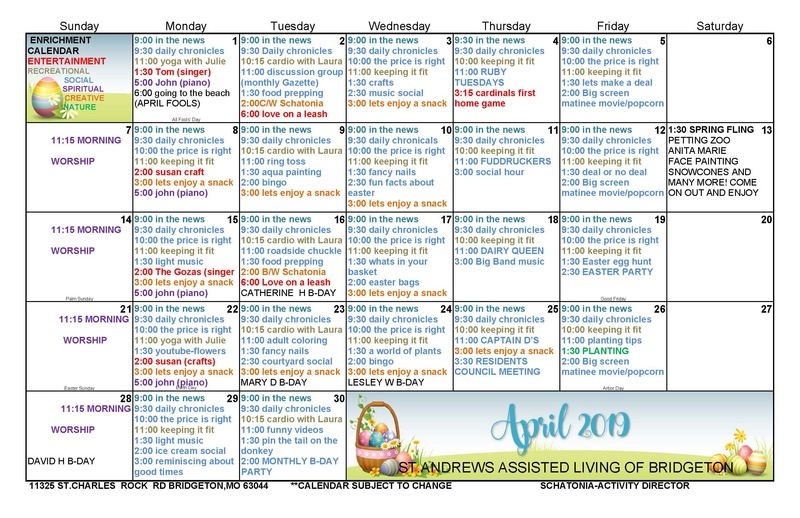 In addition, we provide a calendar of social get-togethers, exercise classes, card games, entertainment, and trips to various events in the community. Our full time Activity Assistant works closely with you to provide the types of activities in which you are most interested. To request more information about St. Andrew's Assisted Living of Bridgeton, please complete the following short form.